I have been following "Create & Trade Expert Advisors" videos put together by Miroslav Popov on Youtube. They are very educational and helpful. 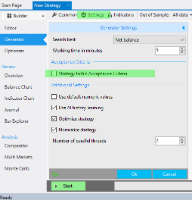 I have managed to import the data from my broker "AxiTrader" into Forex Strategy Builder. 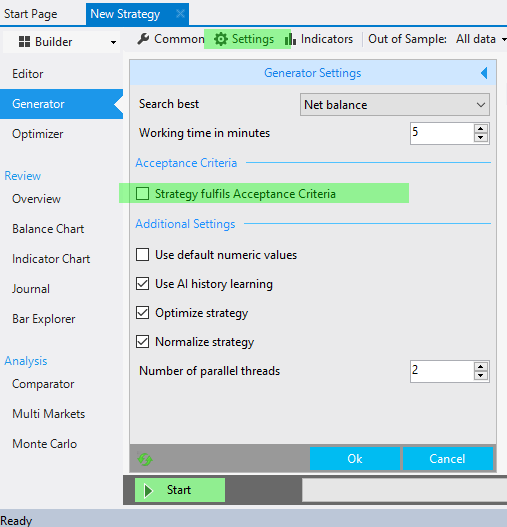 However, when I try to run generator using data from AxiTrader, Generator does not provide any strategy in the collection. It does produce lot of strategies using the default Dukascopy data. Can I please know where I am I going wrong. I am happy to provide my configuration details if it helps to identify the issue. FSB1.png 141.22 kb, file has never been downloaded. One reason can be the lower number of bars and the higher spread. I can suggest you to try with a lower entry amount. Let's say 0.1 lot (You can set it in the Editor). also you can try to temporary switch off the Acceptance Criteria. You are a star Popov. Your suggestion was effective and helpful. Thanks a ton. If, it works, you can experiment with the various Acceptance Criteria in order to receive "better" strategies. One of the recommended options is "Minimum count of trades". Great. I will certainly test this option and continue to explore all the features of the solution.